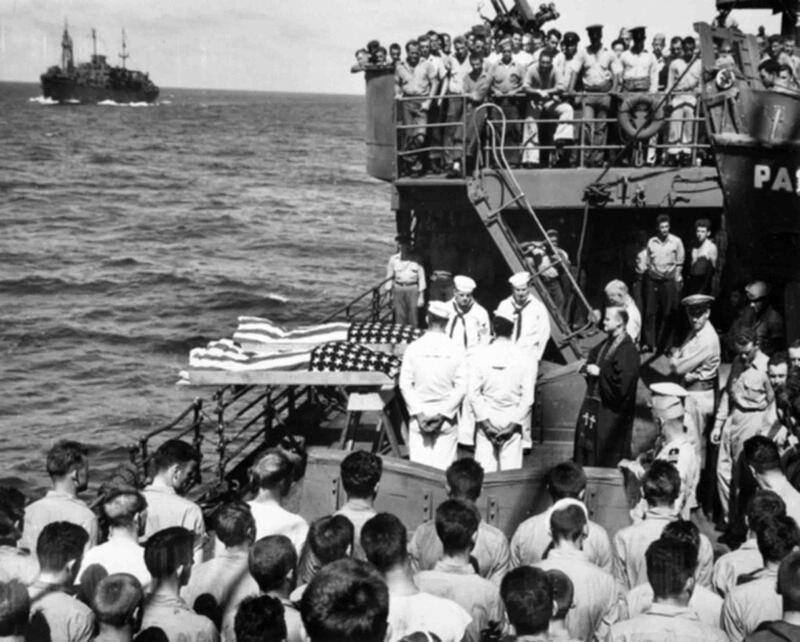 Funeral in the sea of ​​American sailors from the aircraft carrier Liscome Bay, sunk after the torpedo attack of the Japanese submarine I-175 on November 24, 1943 near the Gilbert islands. The Japanese torpedo hit the compartment, where there was a warehouse of air bombs for the aircraft carrier aircraft and a terrible explosion destroyed the ship. Of the 916 crew members, 272 were rescued; among the dead were Admiral Mullinix, captain of the ship Wiltsie and the famous hero of Pearl Harbor kok Doris Miller from the battleship West Virginia, who during the attack of the Japanese on Pearl Harbor helped the wounded and fired on Japanese aircraft from a pair of antiaircraft machine guns “Browning” of the 50th caliber , and for this he received the Naval Cross, the third most important award of the US Navy (the first of the black sailors). In the foreground on the deck of sea transport Leonard Wood is part of the surviving sailors with the “Liscome Bay” aircraft carrier. Ship left in the distance – transport Neville, which housed the other survivors of the “Liscome Bay”.